Each year I promote the women’s pro cycling race, Italy’s Giro Rosa 2017, and each time I also lament the fact that it’s held at the same time as the very high profile Tour de France. As a consequence it passes by almost unnoticed by most sports fans. Up until a few years ago it was considered the biggest stage race on the women’s calendar, but I’d argue that the much newer stage races – the Women’s Tour of Britain and the Women’s Tour of California – have now got a higher profile. Nonetheless I’d like to play my part in promoting the race that’s officially called the rather wordy Giro d’Italia Femminile. The 28th edition of the Giro Rosa takes in plenty of Italy and is played out from Friday, 30 June to Sunday, 9 July. The 10-day stage race takes in four flat and four hilly stages, while two time trials – one for teams, one individual – add up to ten. There are 24 teams taking to the start line in Aquileia with ten Aussie women: Chloe Hosking of Ale Cipollini, Annette Edmondson of Wiggle High5, Tiffany Cromwell of Canyon SRAM Racing, Shara Gillow of FDJ Women’s, Lauren Kitchen of WM3 Energie, Amanda Spratt, Katrin Garfoot, Sarah Roy, Alexandra Manly, Jenelle Crooks riding for Aussie team Orica Scott. The 2017 Giro Rosa starts in Aquileia with an 11.5 km team time trial that sets up the pecking order. Stage Two is mainly flat, yet the riders tackle a 5.2 km climb at 8% with 30 km remaining. The following two days, however, the routes of the 3rd stage and the 4th stage are tailor made for pure sprinters. At 12.7 kilometres, Stage Five is arguably the hardest day in the 2017 Giro Rosa as the route of the ITT takes in two punchy climbs with ramps in the double digits, while Stage Six should suit the fast finishers. The 7th stage runs on rolling roads. This is followed by the Queen’s Stage in number eight. It peaks at a modest elevation of 753 metres with the most challenging section a three staged ascent in the second half of the race. Unlike men’s professional cycling the women’s incarnation receives very little TV coverage but you can keep an eye on the race via social media. Try Cycling Stage and the Giro Rosa Facebook page. 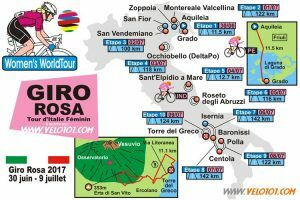 Tell us about your experiences of the Giro Rosa 2017 via comments or the Women Who Cycle Facebook page.